BBC Worldwide has announced a major new deal with Character Options' new Construction division which will see Doctor Who enter the construction toy market for the first time. 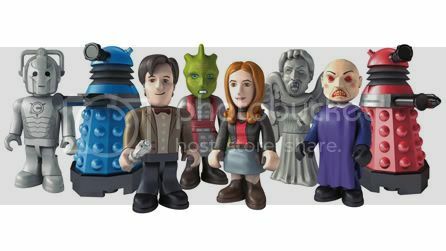 The Character Building range will include 3D micro-figures, brought to life with sculpted facial features whilst play sets will be uniquely tailored to Doctor Who. Fans will be able to build their own Doctor Who world with all their favourite characters including the Doctor and Amy Pond with their famous foes the Daleks, Cybermen and Weeping Angels. Distinctive to the Character Building range will be the use of texture on some of the building blocks, whether it be the sleek and smooth edges of a spaceship, or the rough edges of a rock face. This will be pivotal in recreating each environment, providing a natural look, but still allowing easy construction play. The entire range will be displayed at the Character Options stand at the London Toy Fair with the first products set for release in Spring 2011. It was very surreal and funny coming face to face with a miniature version of myself as the Doctor but I'm glad that the Doctor's trusty Sonic Screwdriver is in his hand, ready to fend off attacks from monsters! I absolutely love these miniature toys of The Doctor and Amy Pond despite the strange sensation of seeing myself immortalised in plastic and miniature and buildable...and dissectible. I'm loving Pond's flaming ginger mane and it's funny to think that The Doctor and Amy are small enough to travel around in someone's pocket. Richard Hollis, who is Head of UK Licensing at BBC Worldwide said the reason the BBC has chosen to work with Character Options is because of the quality and imagination they put into their toys, with Jon Diver, Character Group's Joint Managing Director, saying the new project represents a major investment and we are delighted to be increasing our Doctor Who portfolio.